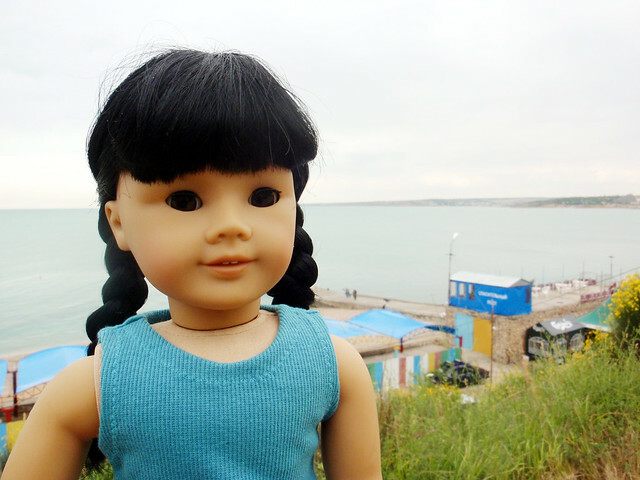 A Day in Sevastopol - Super Inky! 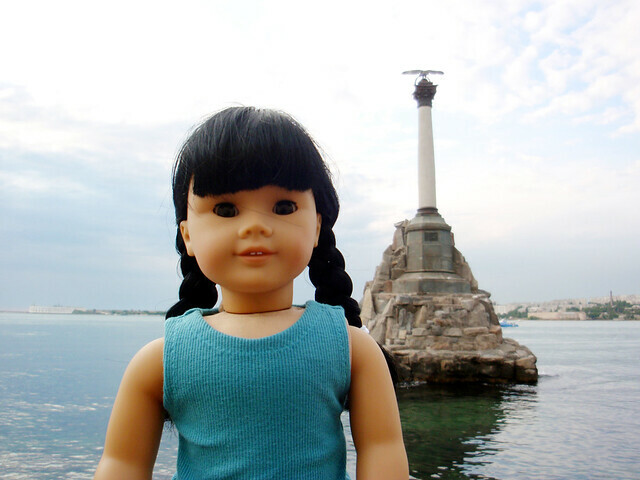 Our first few days in Sevastopol were great. My great-granny, Babushka, made us so much food! I also took lots of naps- I think the jet lag was finally starting to catch up with me. 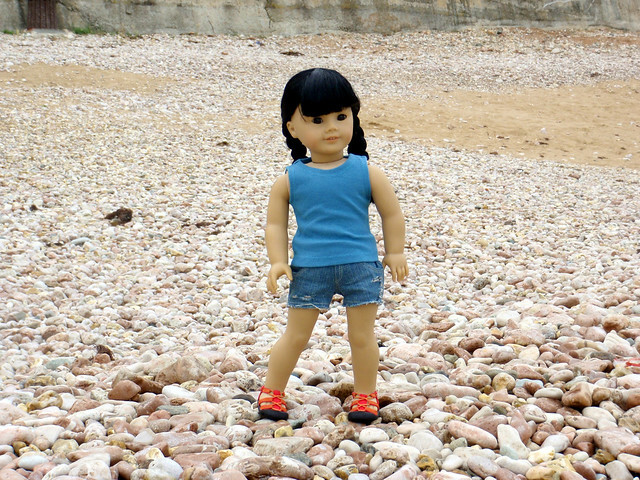 One evening, Babushka took me to the beach! The trip started with a mini bus ride to the harbor. Then, we took a ferry across the harbor- this photo is of me crossing to the harbor to the northern side. Once we got to the other side of the harbor, we hiked past a long row of kiosks, apartment buildings, and then a garage complex. 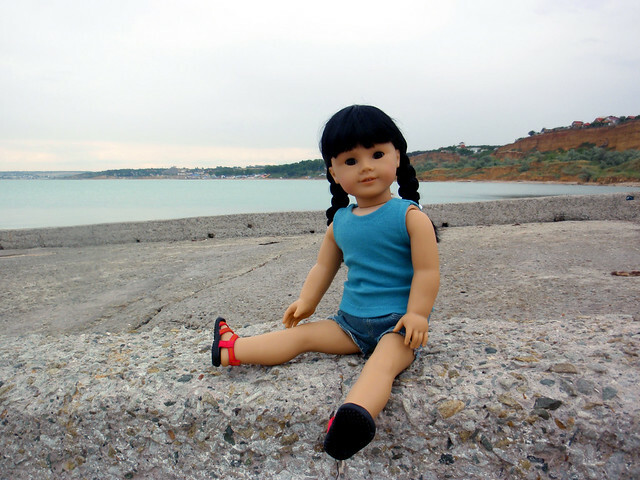 We emerged at the top of a cliff overlooking the Black Sea. Then we had to climb down! It wasn't so bad, but I couldn't help thinking of what it would be like hiking back up! This photo is of me about halfway down the switchback round from the cliff to the beach. See the little beach buildings below me? Finally, we were down on the beach! 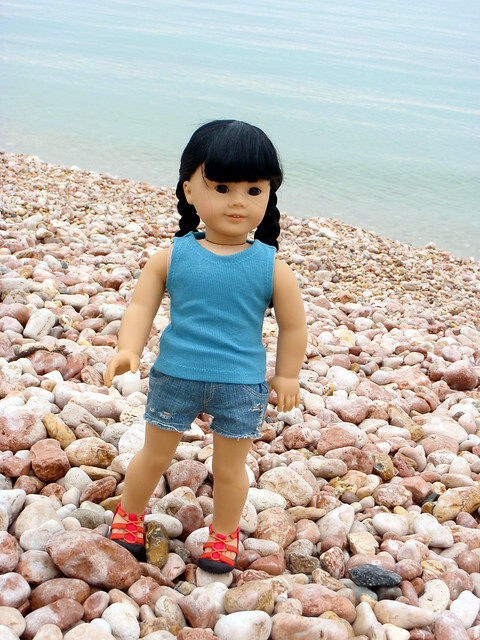 I climbed down to the rocks and ran right up to the shore. The rocks were so smooth- you could tell the waves had been washing them smooth for thousands of years. 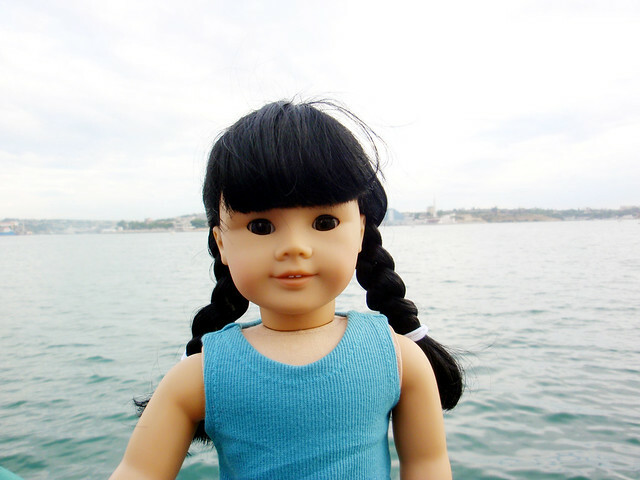 Here I am with the Black Sea behind me- isn't the water a beautiful blue? There were some men swimming in it, but Babushka said it was still really cold. I hadn't brought a swimsuit, or I might have tried it out. There was a long metal pier leading out from the beach into the water. That's where the swimming men jumped from to get into the water. I climbed along the pier and looked at the water. It seemed so amazing that only a few days before, I was at home, looking out at New York Harbor! Finally, it was time to say goodbye to the little beach. I looked out at the water, the buoys, and the ship. I squeezed my eyes closed and made a wish that someday, I would be back, standing on this same beach. Then, unfortunately, Babushka and I had to climb back up the cliff! We took a few little breaks on the way up. 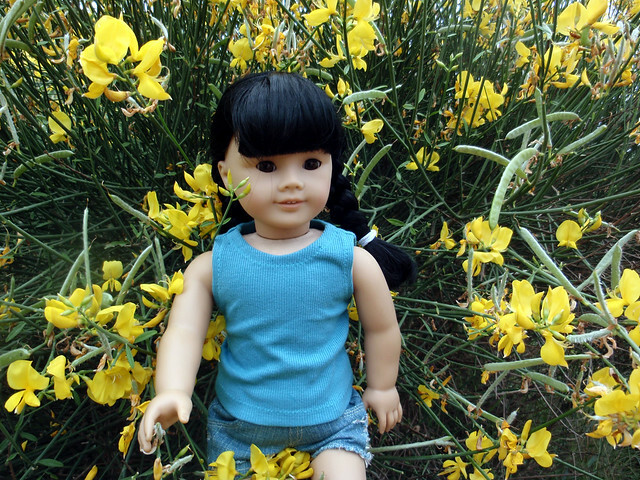 Babushka took this photo of me with these beautiful yellow flowers- does anyone know what kind they are? We took the ferry back across the harbor, seeing the northern side fade further into the distance. Our evening wasn't over- Babushka wanted to show me the harbor! This monument is to the heroes of the Scuttled Ships during the Crimean War. 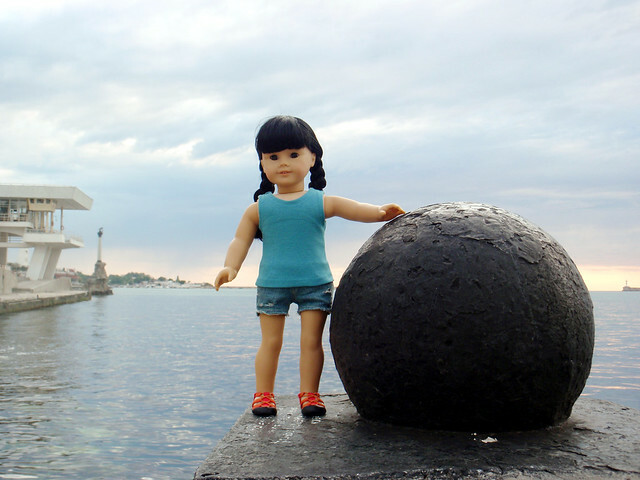 It's well-known as a symbol of Sevastopol, which is an official City of Heroes. Can you see the monument behind me on the left, right next to the parade pavilion? That's where all the important dignitaries watch the parade of ships on Victory Day. We stayed to watch the sun set over the harbor. See the gap between the two breakwaters on the horizon? "Our" little beach is on the opposite side of the breakwater on the right. Sevastopol was quickly becoming one of my favorite cities. It's so beautiful! I took one last look at the harbor before we climbed back up the hill to catch the mini-bus home. 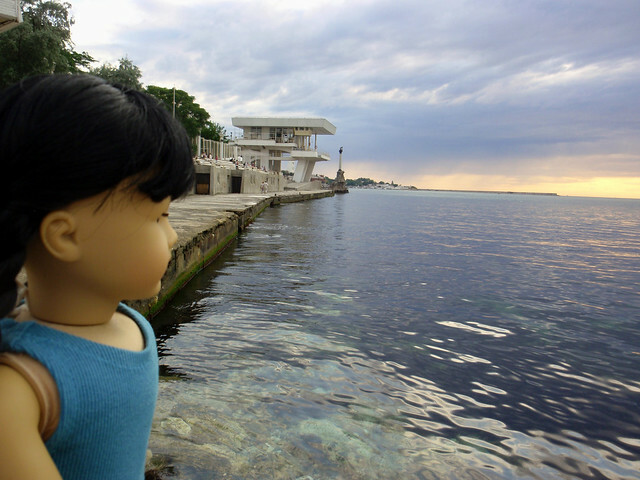 Even though I've done a lot of traveling, I will never ever forget my trip to Crimea. 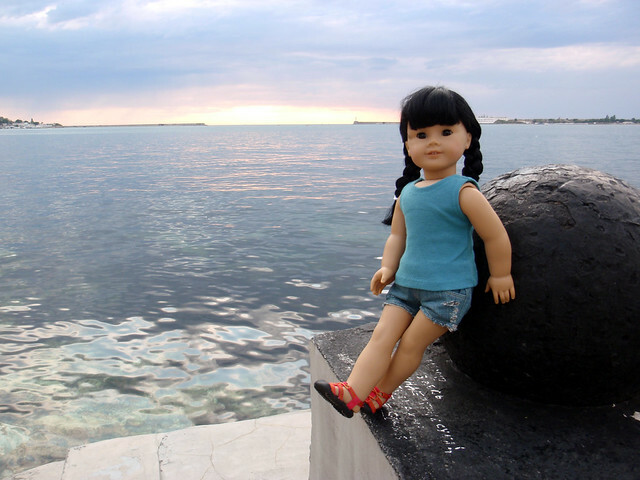 Someday, I want to come back to Sevastopol and see the Black Sea again. I promise, I'll be here again. Wow...that looks so beautiful. I wish I could go some day, just to see that gorgeous sunset. Oh Inky! What a wonderful day! I miss Ukraine so much. One day maybe we'll go back. Such pretty photos, such a beautiful harbor. Wow wow wow! Beautiful photo's Inky .. you always have so much fun and excitement in your life with your travels .. I hope to as well .. I can see why it is fast becoming your favorite town .. it is so amazaing ..
Gorgeous! I hope I can visit there someday! Beautiful photos, Inky! I love the photography and the scenery. My guardian's co-worker is from the Ukraine. I wish she would have worked with her to learn Russian. Then she could have taught us more than "hello" and "goodbye" and "thank you". What a great trip, Inky!